Mission Statement: The BHRCM is a veteran’s motorcycle group. We are a collection of veterans and/or family members who are now serving or have served with the 11th Armored Cavalry Regiment (11th ACR). We are veterans with a common goal. We support the United States of America, the U.S Military, its service members and their dependents, both past and present, and foster strong community values wherever we live. The BHRCM strives to uphold the Honor and Respect of the 11th ACR. We will support other Veteran Groups, activities, and organizations. Honor, Duty, Respect, Family, and Camaraderie are but a few of the characteristics required to ride with the BLACKHORSE. We are not a 1% club nor do we ever intend to be in the future. We are a U.S. Military Veteran Motorcycle Group. We do not claim any territory, state, town, or area. The BHRCM are Veterans who served the four corners of the world for our country and returned home. We ride alone until we meet other Trooper’s, Blackhorse Forever, Forever Blackhorse (BFFB). The name of the group is: BLACKHORSE REGIMENT CAVALRY MOTORCYCLES. 1) The National Chapter location is currently located at: 4411 South Los Maderos Drive, ​Fort Mohave AZ 86426. 2) Change of Address: National Chapter location may change by amendment of these by-laws. The National Board of Officers may change the National Chapter location by noting the changed address and effective date below, and such changes shall not be deemed minor, and require an amendment of these by-laws. a) The back patch is a large center circular patch with a recreation of the 11th ACR military patch in the middle, with a black stallion on a bright white and cavalry red, cross section shield, bordered with military gold on a black background. No additional patches other than those specified here are allowed on the back . b) In military gold, U.S. (above the word: ARMY) will be located on the left side of the shield, 11th (above the letters: ACR) will be located on the right of the shield. U.S CAVALRY above the shield. c) Above the shield in cavalry red, the word BLACKHORSE in a downward arch. Below the shield, the word REGIMENT also in cavalry red, in an upward arch. d) For our motorcycle rider members, a bottom rocker in an upward arch with the word, MOTORCYCLES in cavalry red, will be attached to the large center patch at the bottom, also bordered in military gold. e) All front BHRCM patches will be in cavalry red lettering, military gold border, on a black background. 1. The front LEFT of the vest/jacket of the Colors, will carry the Member’s name at the top over the heart, with officer, title or position above it. 2. Home State or Territory or Country of choice, will be placed on the front left below the name (or pocket if equipped) in stacked lettering. 3. On the bottom front left of the Colors will be placed a patch with the letters “SCM” (State Chapter Member) or “NCM” (National Chapter Member) or “OCM”(Overseas Chapter Member). 6. Both the RIGHT and LEFT sides of the vest/jacket, in front of the side seam (or in front of the leather side tie straps) can be placed any other patches (RIP, IN MEMORY OF, VETERAN), within good taste. It is not restricted, but recommended that patches not contain vulgar remarks or sayings. Service patches, ribbons, medals, awards, decorations and lapel pins are also highly encouraged. 1) Support 11th ACR Active Duty, Combat/Prior Service Veterans and their families. 2) Support Veterans Organizations Nationwide. 3) Support Military Veterans and their Families. 4) Be active productive members of our communities. 5) Promote a better image to the public of Veteran Motorcycle Groups in general. 6) Be family oriented, responsible members with conduct befitting a Blackhorse Regiment Cavalry Motorcycles. 7) Create a Benevolent Fund to help BHRCM members and families. b) Who is a Veteran of the 11th ACR, verified by submitting a DD 214 or ERB as proof of service or a dependent or spouse of a deceased 11th ACR Veteran. c) Must be a current member (either Lifetime or Annual) of the Blackhorse Association. a) Have never served in the11thACR. b) Must join and maintain Blackhorse Association membership. c) Must pay full BHRCM membership dues and remain current. a) Be of good character. b) May not hold a BHRCM Board of Directors officer position. c) Auxiliary Member - Must be a spouse, widow or widower of a Full Member. 4) Honorary Members - May or may not have served in the 11th ACR . 5) Members should attend at least one Military / Veterans function per month. 1) Should have a valid motorcycle license. 2) Should own and operate their motorcycle but, could operate a rented or borrowed motorcycle. 3) While a BHRCM member, owned and/or operated a motorcycle. 4) Members no longer able to ride due to health, injury, age, own decision or permanent loss of motorcycle driving license may retain MOTORCYCLE Rocker if previously qualified. 1) The President: (NP) Will preside over all National Meetings; serve as Chairman of the National Board of Directors; issue the call for regular and special National Board of Directors meetings; schedule regular elections and be sure they are held IAW these By-laws; and carry out the motions passed by the National Board of Directors. 2) Vice-President: (NVP) shall perform all duties of the President in his absence. He is to assist the President in maintaining accurate membership rosters and current membership qualifications. Act as representative of the group at the will of the President in issues concerning the BHRCM. 3) Sergeant at Arms: (SA) will maintain order at all group functions. Ensure order within the general membership by enforcing group By-laws. Act as representative of the group at the will of the President in issues concerning the BHRCM with other entities. 4) Treasurer: Shall receive all forms of income for the group, maintain accounting and make payments for the group. Establish and maintain a PayPal account under the Blackhorse Regiment Cavalry Motorcycles. Issue instructions on use of the PayPal account for membership dues collection, donations and expenditures to include the BHRCM Benevolent Funds. Group accounting will be open for review by the President at any time. The Board of Directors shall receive an emailed monthly itemized account statement by the 15th of each month and year end account statement NLT 15 days after fiscal year end. All APPROVED reports will be posted under the FILE TAB on the BHRCM Facebook page. BHRCM Group Dispersions: Treasurer should not disperse funds without emailed authorization from the President or his appointed representative. Only payments Motioned & Seconded as noted in the National Meeting Minutes should be dispersed. Emergency payments can be approved over the phone by a Special Board of Director meeting as long as the meeting requirements are met as outlined in Article 5, section 1. All expenditures will be posted under the FILE TAB on the BHRCM Facebook page. 5) Secretary: Shall maintain all meeting minutes. Recording of the minutes by electronic device is the preferred method so better documentation can be achieved. Documented meeting minutes must be submitted to the President within 10 days for his review prior to posting on the BHRCM Facebook page within 15 days from meeting date. All APPROVED reports will be posted under the FILE TAB on the BHRCM Facebook page. 6) The Voting members of the National Board of Directors consists of the Vice President, Secretary, Treasurer, Sergeant at Arms and two members at large . The BHRCM Founder also has one vote. The President may vote only in the event of a tie. The two members at large should be volunteers and approved by the voting members of the National Board of Directors. 1) A quorum for conducting business shall be those present at any given meeting. A quorum must have a minimum of five members, three of which must be National Officers. If only three members are present, to make up the minimum quorum, two additional members must interact with the meeting members by phone. 2) Special membership meetings and special Board of Directors meetings can be called by the President or two active members. 3) Roberts Rule of Order will be applied during meetings to affect parliamentary procedures, unless otherwise amended and provided for in the bylaws. 4) The National Board of Directors shall post a Facebook Event with the key points of discussion for the National Meeting not later than 15 days prior to the National Meeting. This post shall include the date, time and location for the meeting. Members may express their opinions or submit items for consideration on this Facebook Event post. To stay on key point subjects, only post to the Facebook Event post, not the BHRCM Facebook page. This keeps all conversation material in one location for meeting consolidation and review. 1) All changes to these Bylaws as they are written will require a majority vote of all Officers. The Bylaws will be reviewed annually by each Officer and proposed changes can be brought forward for a majority vote. Changes must be submitted in writing and voted on. 2) These Bylaws have been written in conjunction with Bylaws from the Original organization as well as updates from numerous Military Groups nationwide. 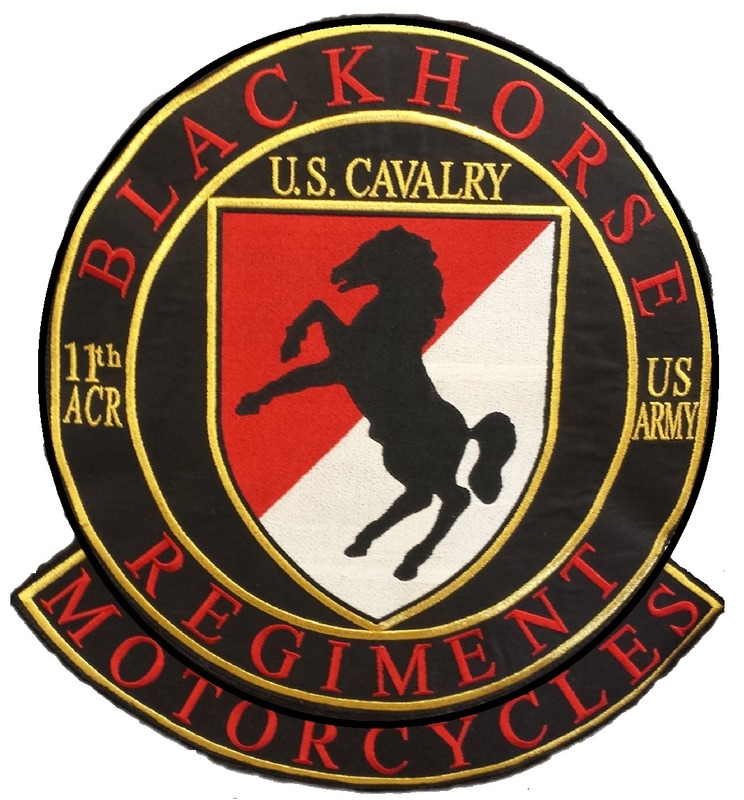 3) These bylaws are the sole property of the BLACKHORSE REGIMENT CAVALRY MOTORCYCLES.